The Linear Pro Access FM345 Pin Lock adds additional security to your system. As a substitute for the clevis pin at the front mounting point of PRO Swing Gate Operators to help prevent theft of the opener, and for the PRO Slide Gate Operators to secure the quick chain release used for manual operation. The RB345 pin lock is a substitute for the clevis pin at the front mounting point of the Linear Pro Access/PRO DC series swing gate operators and the chains of the DC slide gate operators to hinder the theft of the operator. The Pin Lock helps provide security and peace of mind by preventing a gate opener arm from being removed or stolen and allowing unwanted access to the property. The Pin Lock substitutes for the clevis pin at the front end mount of all models of Linear Pro Access swing gate openers, and it does not allow the clevis pin to be removed from the gate without a key to the lock. 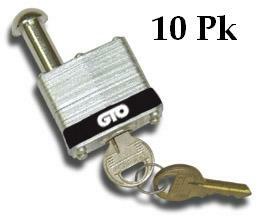 The pin lock comes with two keys that will allow quick release of the opener when needed.